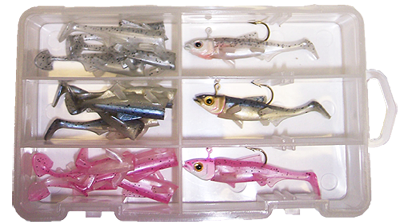 3 Rigged Minnows + 12 Extra Bodies in a 6 compartment reusable plastic box. Variety of colors. Great for anything that swims. This lure is good for Striper, Muskie, Bass, Pike. Game fish love an easy meal. This one is primarily made for casting.